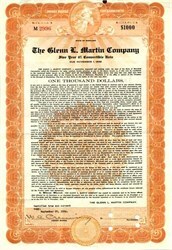 Beautifully engraved $1000 convertible bearer bond certificate from the Glenn L. Martin Company issued in 1936. This historic document has an ornate border around it with the company's name on top center. This item has the signature of the Company's Assistant Secretary with the words certified true and correct copy dated September 29, 1936 above the signature. Punched cancelled. This certificate over 82 years old. The Glenn L. Martin Company was an early U.S. aircraft company founded by aviation pioneer Glenn Luther Martin. The company went through a number of mergers over time and now exists as Lockheed Martin. Glenn L. Martin Company was founded by aviation pioneer Glenn Luther Martin on August 16, 1912. Martin started out building military trainers in Santa Ana, California, and then in 1916, accepted a merger offer from the Wright Company, creating the Wright-Martin Aircraft Company in September. This apparently did not go well, and Martin left to form a second Glenn L. Martin Company on September 10, 1917, this time based in Cleveland, Ohio. Martin's first big success came during World War I with the MB-1 bomber, a large biplane design ordered by the US Army on January 17, 1918. The MB-1 entered service after the end of hostilities, but a follow up design, the MB-2, was also proved successful and 20 were ordered by the Air Service, the first 5 under the company designation and the last 15 as the NBS-1 (Night Bomber, Short range). Although the War Department ordered 110 more, it retained the ownership rights to the design and put the order out for bid. Unfortunately for Martin, the production orders were given to other companies that had bid lower, Curtiss , L.W.F. Engineering , and Aeromarine . The design was the only standard bomber used by the Air Service until 1930 and was used by 7 squadrons of the Air Service/Air Corps: 4 in Virginia, 2 in Hawaii, and 1 in the Philippines. In 1924, Martin underbid Curtiss on production of a Curtiss-designed scout bomber SC-1, and ultimately produced 404 of these. In 1929, Martin sold the Cleveland plant and built a new one in Middle River, Maryland, northeast of Baltimore. During the 1930s, Martin built flying boats for the U.S. Navy, and the innovative B-10 bomber for the Army. It also produced the famous China Clipper flying boat used by Pan American Airways for its San Francisco to Manila route. The company built the 531 B-29 Superfortresses and 1,585 B-26 Marauders at its Omaha plant at Offutt Field (later known as Offutt Air Force Base). Among the B-29s were the Enola Gay and Bockscar which dropped the war-ending atomic bombs on Japan. Postwar efforts included unsuccessful prototype XB-48 and XB-51 bombers, the B-57 Canberra night bombers, the P5M Marlin flying boat, and the Martin 4-0-4 twin-engine passenger plane. Martin produced the Vanguard rocket, which was used by the US space program as one of its first launch vehicles as part of Project Vanguard; the Vanguard was the first US rocket designed from scratch to be an orbital launch vehicle rather than a modified sounding rocket (Juno I) or ICBM (Redstone). This experience helped the later Martin Marietta and Lockheed Martin become the premier manufacturer of spacecraft for NASA, producing elements of both Apollo and the Space Shuttle and (eventually) the entire Orion spacecraft. By the end of 1951 George M. Bunker and J. Bradford Wharton, Jr. were asked to take over the management of the company. As part of a refinancing plan Glenn Martin was given the title of honorary chairman and his 275,000 shares in the company were placed in a voting trust. Glenn Martin resigned his position in the company in May of 1953, but remained as a company director until his death. George Bunker succeeded Martin as president and chairman and directed the company for the next 20 years. Pearson, who was demoted to vice-president, later resigned. Bunker and Wharton were successful in arresting the company's losses and by the end of 1954 declared the company out of debt. Martin, who never married, died of a stroke in 1955 at the age of 69. Martin merged with the American-Marietta Corporation in 1961 to form the Martin Marietta Corporation, which eventually merged with the Lockheed Corporation in 1995 to form the Lockheed Martin Corporation. The Martin Company employed many of the founders and chief engineers of the American aerospace industry, including Dandridge M. Cole, Donald Douglas, Lawrence Bell, James S. McDonnell, J.H. "Dutch" Kindleberger (North American Aviation), Hans Multhopp, and C.A. Van Dusen (Brewster Aeronautical Corporation). Martin also taught William Boeing how to fly and sold him his first airplane.